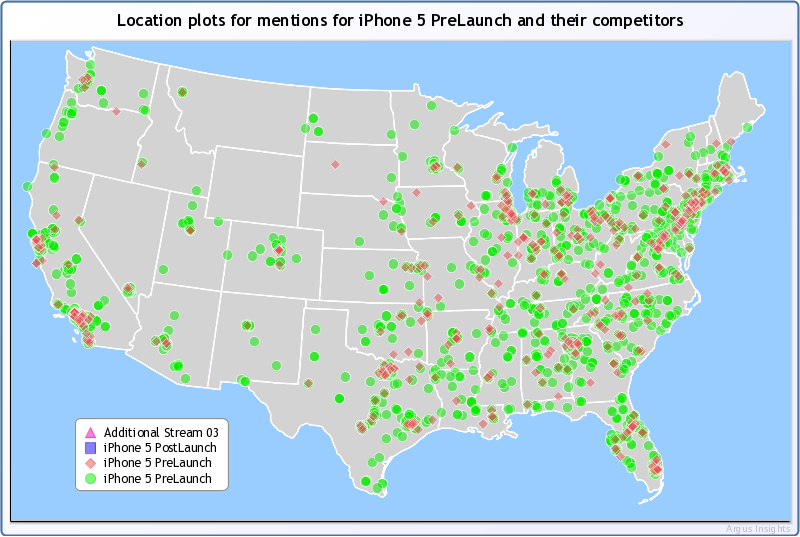 While there’s little surprise that the iPhone 5 has already sold out near term inventories, what is a surprise is how much more the public was engaged with the iPhone 5 launch over the iPhone 4s launch. Much has been written on the mixed response of the market to the iPhone 5 but little as compared the iPhone 5 to the iPhone 4S launch in Oct. 2011. 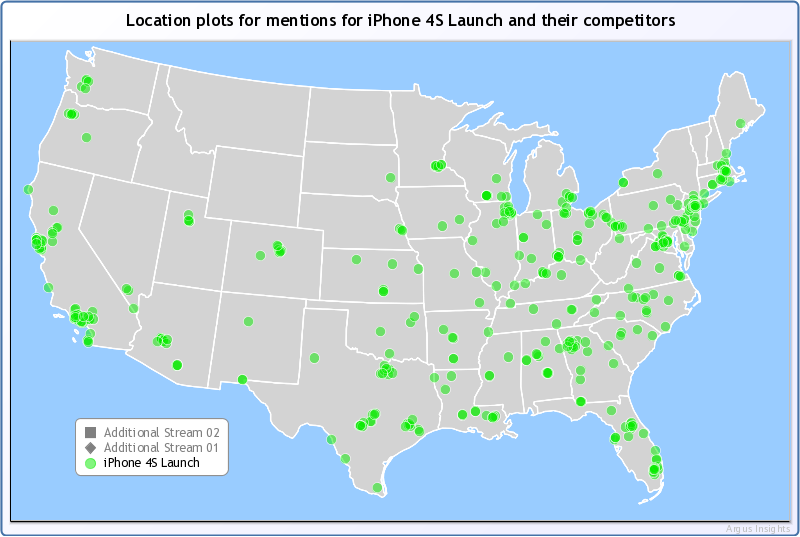 Argus Insights has done a historical analysis, looking at the social media mentions around the iPhone 4S launch and comparing that to the iPhone 5 launch. We’ve also extracted the number of retweets as a way to measure market engagement with the two events. 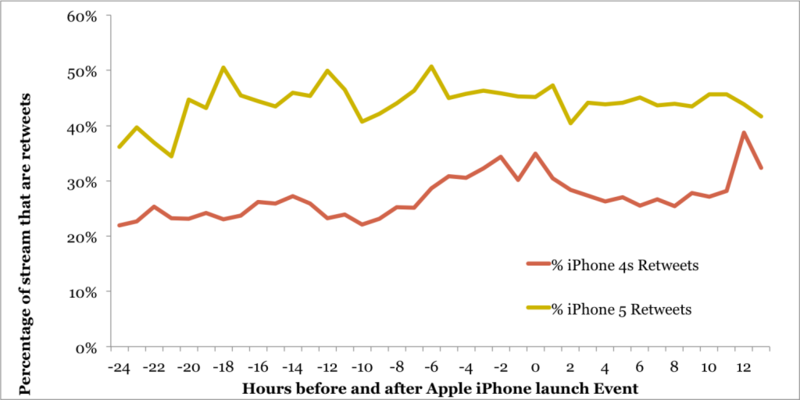 As you can see from the graph above, the raw volume of traffic for the iPhone 5 launch was more than twice the volume of the iPhone 4S launch almost a year ago. Along with the obvious argument that there are just more people using Twitter than a year ago, more than doubling of volume also indicates an increased level of excitement for this particular product launch. Argus watched the traffic change minute to minute during the launch as excitement ebbed and waned for the different features being discussed on stage. When we look at the level of retweets, it’s even more telling the differences between then and now. 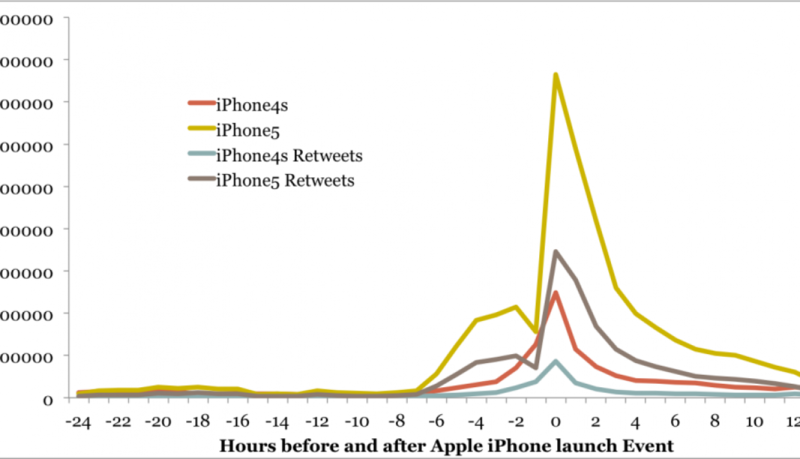 Again, the level of retweet traffic was almost twice of the iPhone 4s launch. 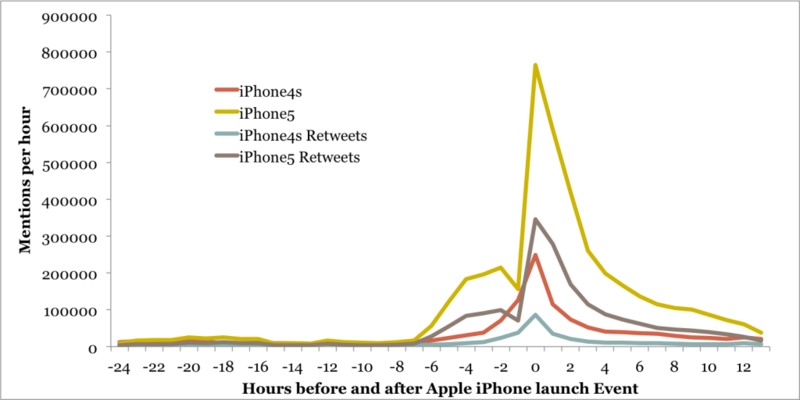 At Argus Insights we believe this higher level of retweet actually indicates a great audience engagement with the iPhone 5 launch over a year ago. We view retweets as an indicator of the general twitter audience engaging with the event. 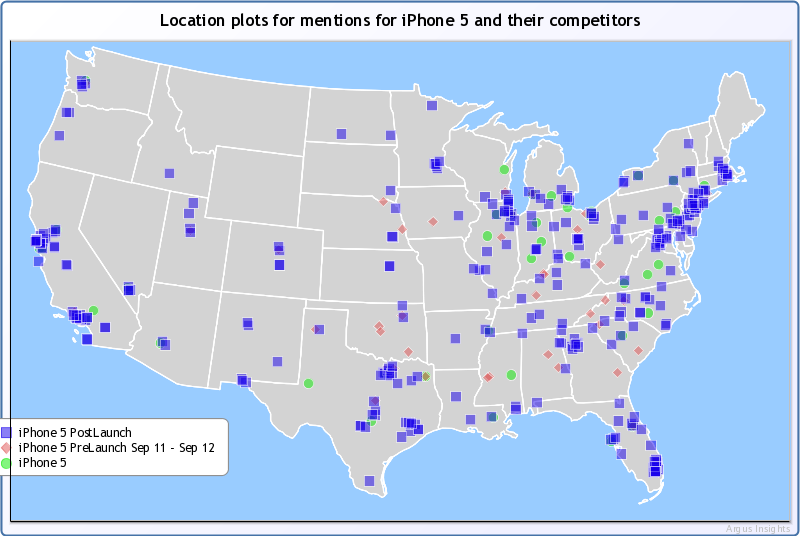 Sure a lot of people are excited about the iPhone 5 and much of the traffic was from the press in the room but a significant amount of their messages were amplified through retweets. We believe this indicates the iPhone 5 will be a bigger launch than the iPhone 4. 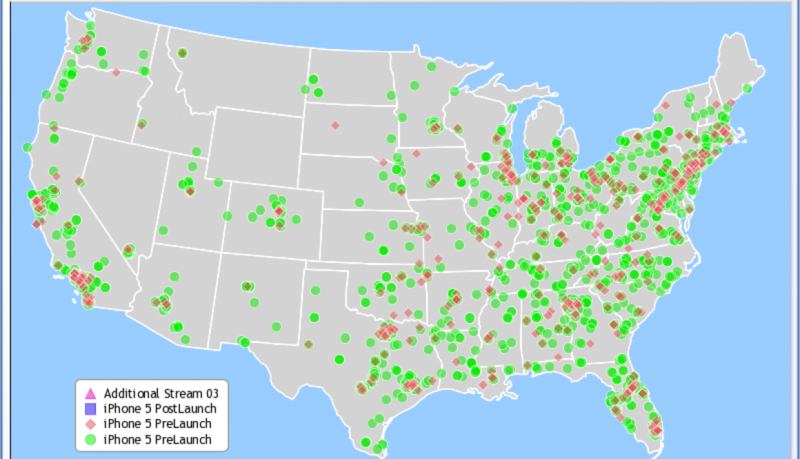 In fact, when you see how wide spread the location of the traffic is for the post launch of the iPhone 5, you realize how many people across the United States were tracking the launch in real time, sharing their hopes and hatreds of the new device. 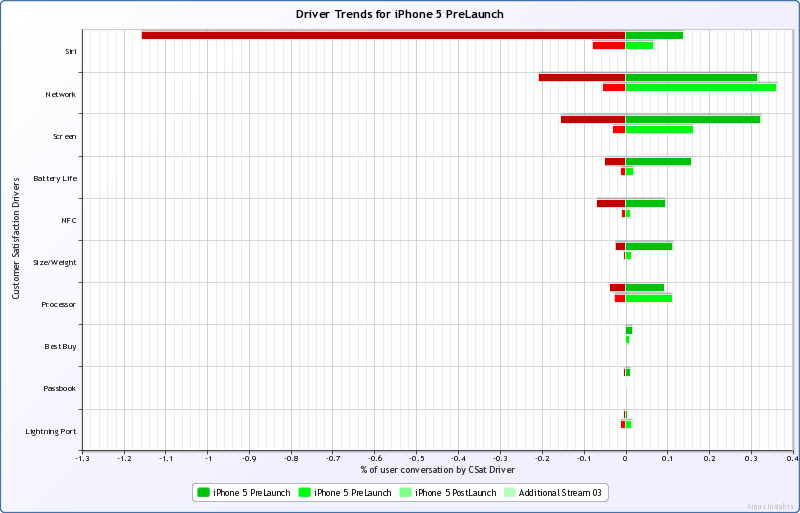 The same view for the launch of the iPhone 4s shows traffic not as wide spread as for the iPhone 5. So while the phone itself received a mixed reception, the sure volume shows that this will be a big launch for Apple and their competitors.